balzer projects is pleased to present the most recent work of Scarlett Bowman (*1988, U.K.), Sebastian Mejia (*1981, Colombia), and Werner Widmer (*1967, Switzerland). While Sebastian Mejia has already had two solo exhibitions and has participated in several group exhibitions in the gallery, Scarlett Bowman and Werner Widmer are being shown in gallery for the first time. Dysfunctional Alterations. 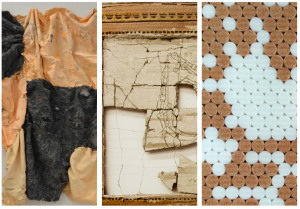 exploring materials shows works by artists who prioritize the material. In their work, the material effectively becomes the idea, and often demands the full attention of the viewer. The selected (mostly) sculptural works focus on materials such as construction netting, plaster, sugar, faux fur, card-board and wood, along with craft methods of production such as stitching, to question the value of labor and social hierarchies. Scale plays an important role in the exhibition as well, with works ranging from a focus on the micro to the macro.